Innovative marketing programs which would include national print magazine advertising, newspaper advertising, digital marketing, as well as a regular program of full colour promotional flyers. We negotiate with radio and TV where feasible. In addition, the company provides high-quality, point-of-sale materials and gift cards for ongoing promotions and advertising. Purchasing power which is unparalleled in the residential lighting category. Volume discounts and terms are negotiated with key trade suppliers, importers and manufacturers, as well as a potential incentive trip program. Keeping on top of current trends and bringing them to our local markets, with competitive pricing is of prime importance. Store designs by our experienced staff will provide you with an engaging and exciting look to your store with every detail well planned in advance with layouts for fixtures, cash area, office, warehouse, etc. Our stores are highlighted with bold signage and our store-front windows showcase the quality lighting products we offer to our customers. Operational and Merchandising support is provided by Head Office both in-store and at the office with training sessions from designated suppliers. We offer assistance with social media initiatives, merchandising direction and operational attention. 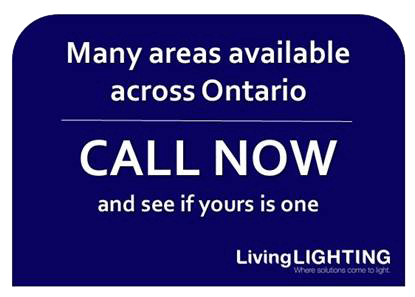 Every home, apartment and cottage requires lighting products. Renovations, new homes, and redecorating projects all result in a need; whether it’s new lamps for a living room, a chandelier for the dining room, task lighting for the kitchen or lighting to enhance your home’s exterior and landscape. Lighting accents the features of a home, completes the setting and provides the magic to create the right mood. Homeowner surveys over the last few years indicate that on an annual basis home renovation projects are the largest growth area. New housing activity generates not only immediate sales, but long term customers, as many homeowners will continue to re-decorate and upgrade their lighting over a period of years after moving into a new home. LivingLIGHTING where solutions come to light, has access to every product you would expect to find in a specialty lighting store such as lamps, chandeliers, outdoor fixtures, ceiling fans, track and recessed lighting, undercabinet, shades, light bulbs, LED lighting and a wide range of decorative accessories. If it’s lighting related, we’ve got it! Emphasis is placed on unique, well designed, lighting and decorative accessories, which appeal to Canadians in the middle to upper income groups.